Artem Lobov and Paulie Malignaggi’s rivalry escalated at yesterday’s BKFC’s media day event. ‘The Russian Hammer’ and ‘The Magic Man’ engaged in a heated confrontation where Malignaggi yelled threats at Lobov and then slapped him. Although the two caused a ruckus, BKFC President, David Feldman said no punishments will be handed down. Ultimately, Feldman is fine with the altercation as he can now use that to help promote their potential fight in the summer, barring Lobov beats Jason Knight on Saturday. “As a promoter, you want that kind of stuff to sell a fight. I didn’t want it here today,” Feldman told MMA Junkie. “I wanted it after Saturday. But, it happened. … I just wanted to introduce Artem and his fight coming up and get everyone hyped about this fight. Artem (fighting) bare knuckle is big news, then us signing Paulie Malignaggi, that’s bigger news, and I wanted to maybe preview what maybe could happen in June. But I never thought that was going to happen. I’m very surprised that they went face to face like that. 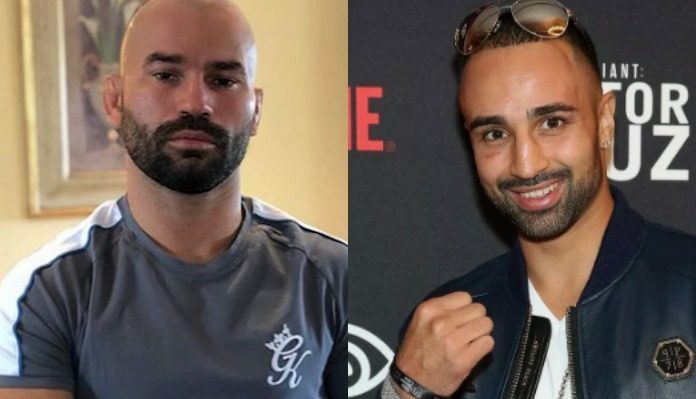 The rivalry between Lobov and Malignaggi dates back to when the former boxer helped train with Conor McGregor for his fight with Floyd Mayweather. In order for the grudge match to come to fruition, Lobov must first win on Saturday night. With that, Feldman knows the pressure is on ‘The Russian Hammer’ given Malignaggi has said he won’t fight Lobov if he loses on Saturday.